A supreme hot dog scene is just another thing to check off the list of things Texas is great at. How many ways can one dress up a dog in the first place, you may be asking? Ketchup, mustard—The works! Trust us when we say, us Texans know how to customize our tasty treats to our exact liking. Check out our top picks for hot dog joints in our great state of Texas! Oh man. This is an Austin classic with cool and boozy beverage choices to pair special dogs made up of premium ingredients such as antelope, smoked duck and even alligator! This is the place to be for Sunday brunches and pretty much every other day of the week as well! Tons of beer on tap, communal dining indoor and their outdoor seating is especially nice when there’s live music or other happenings at this hotspot on the hip, Rainey Street district. Everything is pretty much delish here, but their award-winning dish is well...you guessed it…The Angry Dog! You’ll need a knife and fork for this monster doused in cheese, onions and chili. This hot dog joint is known for its unique toppings. They’re combinations of toppings on hot dogs are absolutely insane but so worth it! Well this is the true definition of a mom and pop shop. 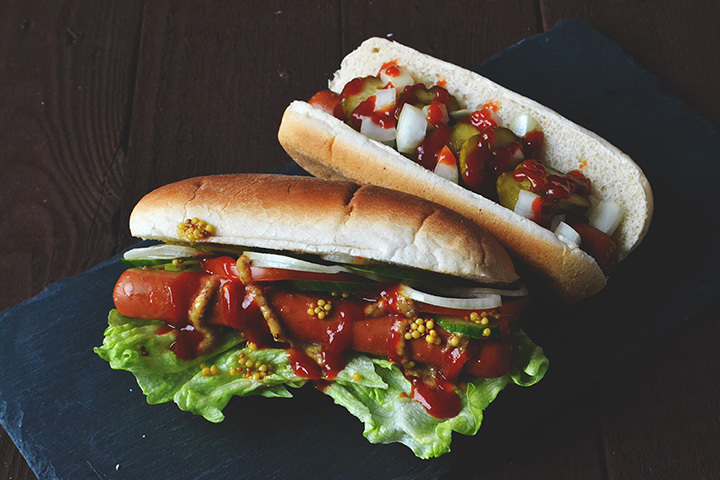 It’s cute and they’re known to serve the perfect classic hot dog with mustard, ketchup and onions. What combination could be better? This place has us drooling for more. How about bacon? How about beans? How about all of that put together? Absolutely! Now we’re talking! $1 hot dogs on Sundays and other meal options that are to surely make your mouth water. Where else would you grab a dog no other than this famous joint in Bryan, Texas? The dogs here are pretty traditional but the flavor is explosively good! They said it! ALL BEEF hot dogs served here with tons of hot and fresh fixings that even soak through the bun. They’re all about true flavors here. We’re all for getting our hands dirty for these dogs! Get your very own Chicago-style hot dogs here plus many other things! By Chicago style they mean brats and polish dogs with all types of fixings you can think of. Just ask!